The other day as we were in the throws of our usual morning routine, I looked up from the collection of backpacks, lunch boxes and jackets I was gathering to be stunned by an almost filmic scene that my daughter was starring in. Bathed in matinal light, she calmly looked over commenting on something I have now forgotten. What I do remember, as I write this, was being struck by what I perceived as a child becoming a young woman*. This beautiful being blossoming. It was humbling to say the least. *10/11/12: I want to reconsider this idea of a young woman. 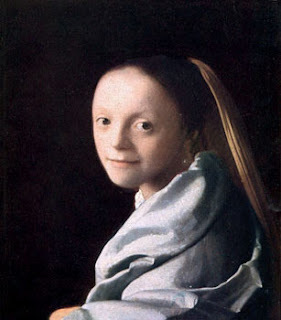 In Siri Hustvedt's essay Notes on Seeing, she reflects on a Vermeer's Study of a Young Girl (see below). At the Met, where it hangs, it is labeled Study of a Young Woman. Siri brings up the idea that we should not turn girls into women too soon. So in agreement, I'd like to adjust my above thought to: a child becoming a young girl. I think there is a necessary distinction here between, a child, a young girl/boy, and a woman/man.